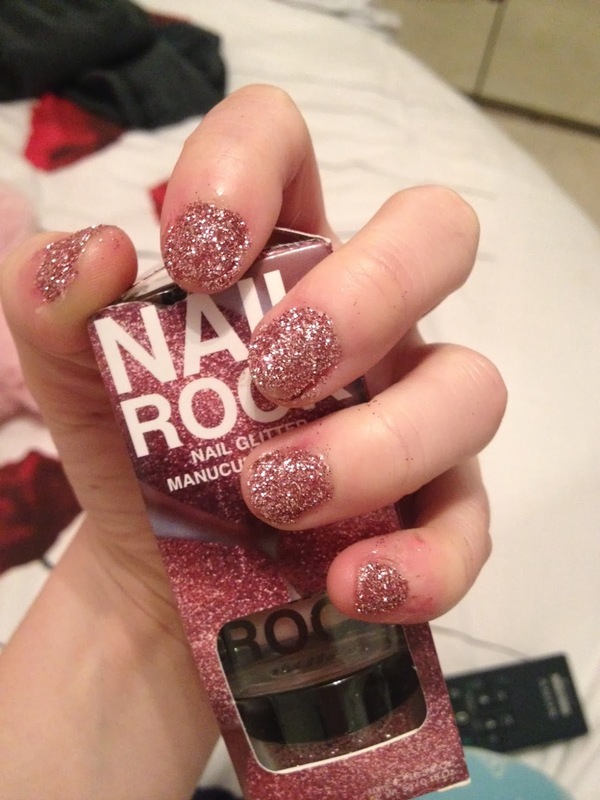 Tartan Fairytales : Nail Rock Glitter Nails Review! For Christmas, my amazing big cousin Nicola got me the 'Nail Rock Glitter Nails' in Pink. She knows how much I love doing nice things to my nails (i loved the caviar trend) so this was perfect for me. 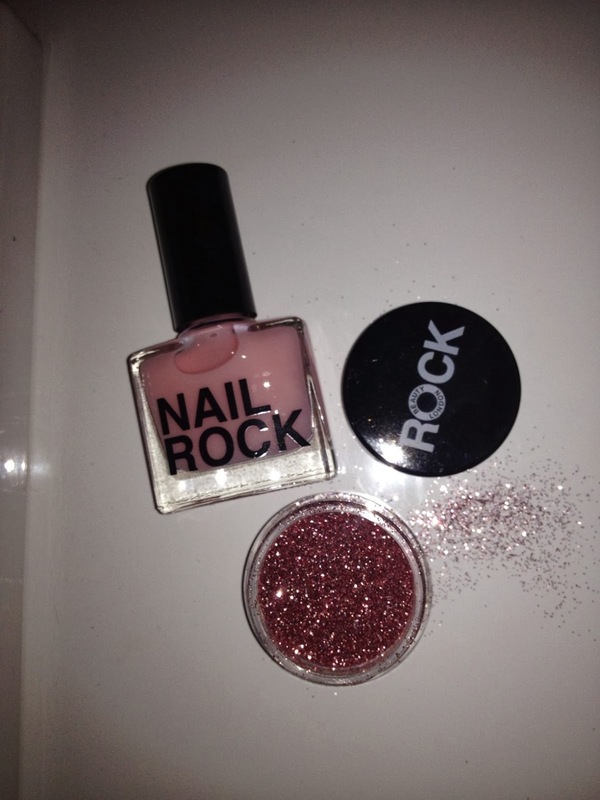 In the kit you get a nail polish and a big pot of glitter in similar colours. I am normally not a pink kind of girl but I think this colour is absolutely gorgeous. My cousin also said that she wouldn't have normally picked pink for me but she was drawn to it and I totally understood why. The polish is a baby pink and then the glitter is a little darker which just gives it that little something extra. 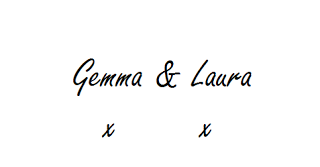 The kit also includes instructions on how to apply the glitter and I was surprised at how simple it was! All you have to do it paint your nails with two coats of the polish and when your nail is still wet, dip it into the pot of glitter. I honestly thought it would be so much more complex and messy! Once all your nails are done you have to leave them to try for 15-20 minutes, I left mines about half an hour though, one whole episode of 'My Wife and Kids!' Once they have dried, you just brush of the excess and you are good to go. This was the finished result! Apologies about the state of my nails, working in a shoe shop, moving boxes around and so, my nails are constantly snapping. Not good. So I had just recently filed them to give them a chance to grow again. Honestly I loved the instant glamour of my nails and I thought these would be perfect for a night out. I done this at around 7pm and for the rest of the night just took it easy. Had some wine and watched a movie with my family! When I went to bed they were still in perfect condition. However, this was not the case when I woke up the next day. Most of my nails had absolutely nothing left on them and a few were left with a tiny amount. My bed sheets were coated in glitter, I would imagine its what RuPaul's bed sheets look like! I was so so disappointed, I am going to try this again with another coat to see if it makes a difference. If any of you guys have used this and get it to last long, let me know how you did it! If this effect lasted longer than a snooze, it would be my new favourite product. I am sure you can pick this up everywhere, Boots, Superdrug and fashion stores like TopShop sell it as well. Even Missguided stock it. I am sure it is around £7 as well and if it lasted, this would be a great price for what it is.